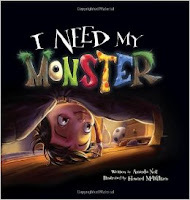 One of the girl’s favorite books is I Need My Monster by Amanda Noll. Surprisingly, even though she is terrified of everything, the idea of monsters under the bed did not frighten her. In fact, she loved Gabe the monster so much; she decided that she was going to be him for Halloween last year. Mind you, Gabe is green and she was pink/purple, but when asked what her costume was, her reply was “Gabe”. I Need My Monster is in our regular rotation of books for bedtime. She’s a big proponent of rereading (night after night after night) so when we’re on a roll with a book, it will be with us for a while. A few weeks ago, I was lucky enough to attend BookExpo America in Chicago. There were many publishers and authors there discussing new books that would be released soon. As I walked among the shiny, slick covers of new and soon-to-be-released titles, I saw the familiar black cover and fonts of I Need My Monster. I felt it was necessary to stop and inform the nice publishing lady how much my child loved the book. But, as I approached the booth, my eyes examined the cover a bit closer. WAIT A MINUTE! There are TWO kids on the cover of this book! I immediately snatched up the galley and began examining the cover mere millimeters from my eyes. Yes, there were in fact two children on the cover…I Need My Monster only had one. Who was this new kid? Where was Gabe? What was going on? Oh My Gosh…is this a new book?!?!?! Fortunately, the nice publishing lady came over and answered my questions as I babbled them incoherently at her (even including the story about my kid dressing up as Gabe). 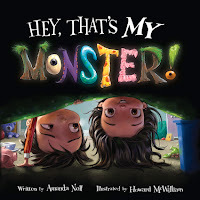 The girl was so excited to see the new monster book, entitled Hey, That’s My Monster, due to be published on September 1, 2016. The story and illustrations are wonderful and just as entertaining as the first book. I am required to read BOTH books at bedtime now, but they are both so good, that it is easy enough to read them over and over (and over). Bedtime reading reminded me of the importance of rereading. As I reread Hey, That’s My Monster for probably the twentieth time, the girl and I had some rather in-depth discussions about how the illustrator chose to show that Emma was making noise. Because we can’t HEAR sound in a book, the illustrator has to figure out a way to show that to us. So the girl and I had to examine the pictures thoroughly to find the ways the illustrator showed us what was going on. Since we have read the book SO MANY TIMES, the girl has the first part of the story memorized. She can recite the first few pages, so he likes to ‘read’ the first few and then tell what’s going on in the pictures on the next few pages. But, she also asks questions for things she doesn’t understand. She wanted to know if Emma was playing with her dinosaurs on the blanket for a reason. After we talked through a few pages, she was able to answer her own question. We are able to focus our bedtime reading conversations on thinking about the story, because we have read the words so many times, she already knows what is going to happen. This allows her to think beyond understanding the immediate story and build a deeper understanding of what is going on. She’ll need this skill later in life, both in school and in the outside world. In school, so often we are worried about making sure the students can READ the words of a book. I completely agree that this is an important skill. But, pulling a group of students together to listen to a rereading of a familiar (and well-loved) story can also allow for deeper conversations and thinking that may not normally occur. Conversing about books with one another is an opportunity we shouldn’t deprive students.